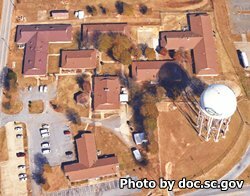 Livesay Correctional Institution is located in Spartanburg South Carolina. The prison is comprised of two camps, Camp A and Camp B. Camp A, formerly known as Livesay Pre-Release Center, holds level 1A inmates which means they are minimum custody non-violent inmates who are in a community based pre-release center and within 3 years of release. Camp B, formerly known as Northside Correctional Institution, holds level 1B offenders which is a minimum security setting with slightly higher security then the 1A inmates. Both facilities house inmates in double bunks, either open bay dorms or in cubicles. The current capacity of Livesay Correctional Institution is 530 inmates. Inmates in Livesay Correctional Institution Camp A can work on labor crews that support various government agencies, and on refuse crews that clean roads and highways. Inmates can also receive pre-release training which helps prepare the inmate for discharge. Offenders in Camp B can work in the correctional industries program manufacturing hardwood flooring. Camp B also offers medical care to inmates at both facilities. Additionally, offenders at each facility can take GED preparation courses. Livesay Correctional Institution uses a rotating visitation schedule based on the first letter of the inmate's last name. Visiting times will rotate, so you will need to contact the facility for the current rotation schedule. Visits occur on Saturdays and Sundays from 8am-12pm and from 1pm-5pm.